I’ve been a history junkie since childhood. My librarian-mom kept me supplied with historical fiction, and family vacations always included stops at historic sites and museums. As an adult I’ve worked as a curator of education and collections at a large outdoor museum, and volunteered as a docent or reenactor at many sites and events. So it’s probably not surprising that Chloe Ellefson, protagonist of my Historic Sites mystery series, is a history junkie too. Writing these books lets me stay in touch with a field I love, and explore topics and themes I’m passionate about. The first, Old World Murder, revolves around an antique Norwegian ale bowl that has disappeared from the historic site where Chloe works. Her research uncovers a link between nineteenth-century immigrant folk art and modern murder. And in the course of solving the mystery, Chloe helps illuminate an overlooked corner of women’s history. Old World Murder is set entirely in 1982, the year I entered the professional museum world. For the second mystery, The Heirloom Murders, I tried something different. Chloe again has reason to wonder if past events might be affecting the present. Although most of the book is set in 1982, I also created a few brief historical scenes to introduce readers to key characters in the chain of events that led to murder. I was surprised (and delighted) by the number of emails and comments I received from readers who appreciated that secondary timeline. As I started writing the third Chloe mystery, The Light Keeper’s Legacy, I decided to develop a richer historical timeline. Chloe visits an island in Lake Michigan as a guest curator, helping to research and restore a beautiful old lighthouse (the very real Pottawatomie Lighthouse in Rock Island State Park, Wisconsin). 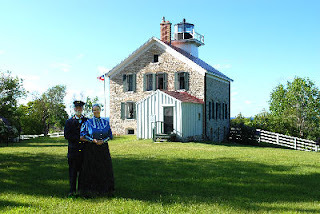 She quickly becomes fascinated with the life of Emily Betts, who did once live in the lighthouse with her family and serve as assistant keeper. Chloe also is drawn to the site of a long-gone fishing village on the island—even though nothing tangible remains of the people who once lived and worked there. I created a fictional Danish immigrant fishwife, Ragna Anderson, as the second main character in the historical timeline. Emily and Ragna’s scenes, which move from 1869 to 1906, are woven among Chloe’s contemporary ones. This structure was, I admit, a bit challenging to create! I needed to respect the real timeline of past events on Rock Island. I also needed to provide specific historical information at points that reflected Chloe’s progress as she investigates a woman’s death. Readers have more information than Chloe does, although the links between then and now don’t become completely clear until near the book’s end. 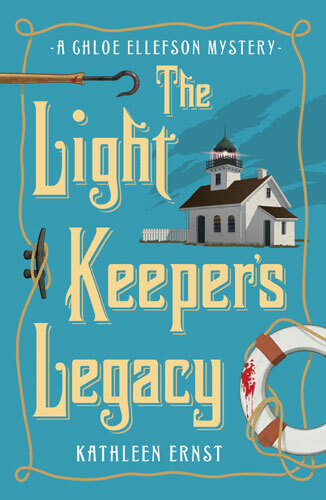 The Light Keeper’s Legacy was recently released, and I’m grateful to the readers who’ve let me know that they enjoyed the dual timeline. It was a fun technique to explore, and I’m sure I’ll return to it again. After all, the past is never really gone. In families and communities, long-gone incidents often reverberate through time. Sometimes past and present collide—and that can be a very good thing for a fictional history junkie/museum curator/amateur sleuth like Chloe Ellefson. I’m grateful to Sheila for allowing me to be a guest on her blog. And I’m grateful to readers! I love my work, and I’d be nowhere without you. Leave a comment here, and your name will go into a drawing; the winner may choose any of my Chloe Ellefson mysteries: Old World Murder, The Heirloom Murders, or The Light Keeper’s Legacy. For more information see my website, http://kathleenernst.com, or my blog, http://sitesandstories.wordpress.com . The Light Keeper’s Legacy is Kathleen Ernst’s twenty-fourth published book. 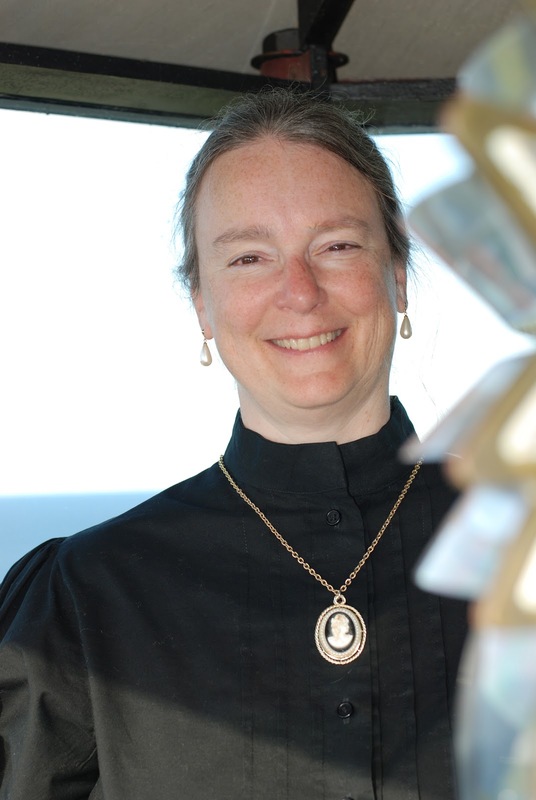 In addition to the Chloe Ellefson series, she has written many books for young readers, including American Girl’s six-book series about Caroline Abbott. Several of her mysteries for young readers have been finalists for Edgar or Agatha awards. Kathleen and her husband Scott volunteer as live-in docents for a week each summer at Pottawatomie Lighthouse. Kathleen, I'm very interested to read one of your books, so I hope I win. My favourite format is epub, but can deal with .azw if necessary. While I'm here I'd like to suggest that you both visit Crime Fiction group on LinkedIn. It's a great place to announce book releases, free days and other crime-fiction-related stuff. Hi Theresa - Thanks for the comment and for the tip! (And thanks for all you do to connect books with readers on your own site!) I didn't know there was a Crime Fiction group on LinkedIn. As for the contest, alas, at this time I'm only able to offer hard copies. Looking forward to reading my first of your books. Thanks for being so generous with your time on the American Girl live chat, my daughter Caroline enjoyed your comments. She is having a lot of fun with the doll being named Caroline especially since she is a competitive sailor! My whole family loves reading your books. We enjoy meeting you at you book signing at Old World Wisconsin the past two years. It is always fun to read a book and then visit the places that are in the book! Yes, we plan on coming on Sunday. The kids don't want to miss it, they enjoy seeing your other books. Hi Kathleen! So glad I'll get to see you at OWW. Fingers cross for a beautiful fall day. I love history. I got hooked when I started researching our family genealogy. So ... I'd love a chance to read one of your books. Hi Fiona - family history is addicting, isn't it? Thanks for commenting, and good luck! Hi Kathleen, I'm looking forward to getting to know your books. I love discovering history through fiction and through genealogy. My next play (after my current book and the next one) will be about my 11th great grandmother who was tried and tortured as a witch in Germany. I find reading about the women in history so interesting as I learned so little about them when I was growing up. Another of my gggggrandmothers was a Revoluntionary War hero because she was trained as a gunpowder maker back in England. She made and furnished 500 lbs of gunpowder to win a crucial battle in NC. There is a monument to her there. Very good read, but feel free to make it easier for yourself and skip the dual timeline because I don't care for it. ;) That said, I did enjoy the stories from both eras. Hi Mike - thanks for sharing your thoughts. No one style or technique appeals to everyone. I love mysteries with that kind of dual timeline going. I'll have to look up your books. And the book winner, chosen by random draw, is...Fiona! Thanks, all.